Announcing “Dr. Jekyll & Mrs. Hyde” – a Top Bananas Slice! – Martin City Melodrama & Vaudeville Co. Announcing “Dr. Jekyll & Mrs. Hyde” – a Top Bananas Slice! 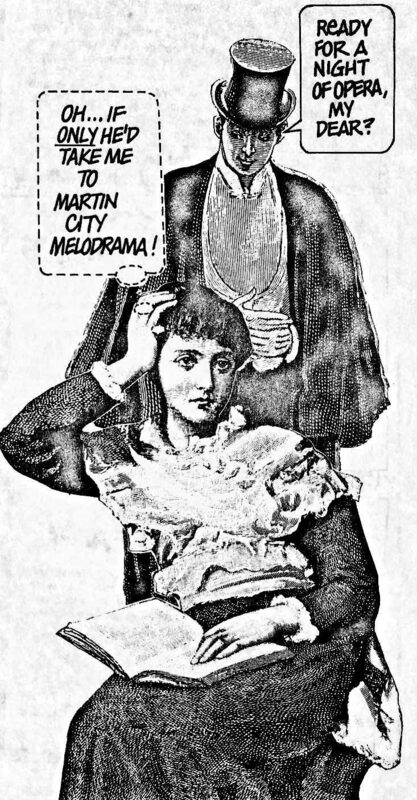 THE MARTIN CITY MELODRAMA AND VAUDEVILLE CO. OPENS IN IT’S NEW LOCATION WITH DR. JEKYLL AND MRS. HYDE © JUST IN TIME FOR HALLOWEEN FAMILY FUN!!! The Martin City Melodrama & Vaudeville Co. is thrilled to present a brand new production in their new, fabulous forever home! As part of the theatre’s mission for ENTER-CHANGE-MENT, Martin City Melodrama & Vaudeville Co. will present an original production Dr. Jekyll and Ms. Hyde©. This production will feature Travis Hensley in his first leading role. Mr. Hensley became involved 5 years ago with Martin City Melodrama’s, TOP BANANAS program which writes, produces and performs theatrical production specifically with and for children, teens and adults with developmental disabilities and challenges. Dr. Jekyll and Ms. Hyde© will be a wacky, wonderful family way to celebrate Halloween at Martin City Melodrama & Vaudeville Co.’s new forever home. Join the family fun of booing, cheering. and lots of laughter as Travis Hensley over-acts the daring Dr. Jekyll. Joining the cast are Anthony LaSalle, Garrett Myers, and Jeanne Beechwood. Also featuring live piano and organ accompaniment to get one and all ready for a hilarious Halloween adventure. Perfect for ages 2 to 102! The Martin City Melodrama’s New Home is 702 Blue Ridge Missouri in GRANDVIEW, Missouri, just 5 minutes away from the theatre’s original location, where it opened 33 years ago. Conveniently located off 71 Hwy or a straight shot across 130th Street all the way from Olathe, Kansas! The new building is 100% accessible and very intimate, with seating for less than 100, featuring cabaret style and brand new chairs. Reservations are essential for this family event. Ask all your “behind the scenes” questions, and more! The theatre will also have soda pop, popcorn, hot dogs and candy available for purchase at their snack bar at the performances. There will be NO peanuts served at this event. Please call 913-642-7576 to reserve your spot today for one of Kansas City’s most unique long-standing family entertainment traditions. Whether you are goofy or ghoulish, don’t miss this show, Dr. Jekyll and Ms. Hyde©! A bewitching time for all Halloween lovers!